Here are the earnings expectations and earnings report dates for Stratasys, 3D Systems, ExOne, Arcam, voxeljet, and Materialise. Third-quarter earnings season kicks off for the 3D printing group on Wednesday, Oct. 21, when Sweden's Arcam (NASDAQOTH:AMAVF) reports before the market opens. Consider this your 3D printing investors' guide to the season -- Wall Street analysts' expectations and earnings dates (for those companies that have announced them) for the six pure plays all in one place. We'll be providing more in-depth earnings previews for the diversified industry leaders Stratasys (NASDAQ:SSYS) and 3D Systems (NYSE:DDD), as well as industrial specialist ExOne (NASDAQ:XONE), soon before they report. The carnage in the 3D printing space began in early 2014 when 3D Systems and Stratasys issued earnings warnings and announced that they were significantly boosting expenditures aimed at stimulating long-term growth. This, of course, meant that earnings would suffer. Not only have earnings suffered, but both companies have been turning in revenue growth below what the market expects from so-called "growth stocks." 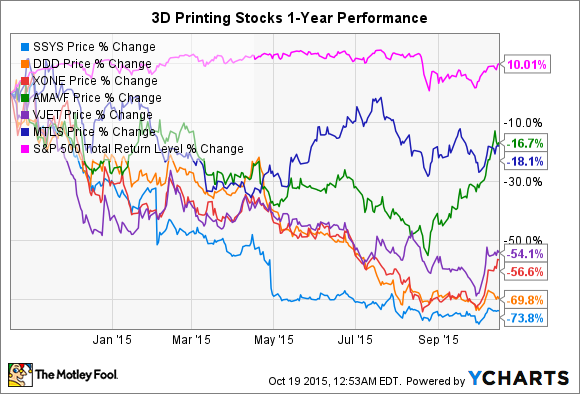 3D Systems has generally turned in subpar earnings reports for nearly two years, while Stratasys was performing relatively solidly until its MakerBot desktop 3D printer unit imploded in the fourth quarter of 2014. The industry's growth and projected growth dynamics, however, remain rosy. With attractive growth dynamics comes increased competition -- and the notable competitors to watch include start-up Carbon3D and Hewlett-Packard. Both have announced plans to enter the market in 2016 with enterprise-focused 3D printers that are considerably faster than the ones currently available. ExOne has missed analysts' expectations and its own revenue guidance since it went public in February 2013. Its third- and fourth-quarter reports are especially critical, as the company's counting on the second half of the year to post an especially outsize portion of its 2015 revenue guidance. ExOne has itself to blame for a portion of the pounding its stock has taken. However, market timing is an especially big factor here. The company went public at the height of 3D printing mania, so its valuation was bid up to stratospheric levels early on. Germany-based voxeljet's (yes, it's a small "v") story is somewhat similar, as it also went public during the tail end of the 3D printing frenzy in late 2013. The stocks of Sweden-based Arcam and Belgium-based Materialise (NASDAQ:MTLS) have performed the best -- or "the least worse" -- among the group over the past year. Arcam's generally been posting solid results, while Materialise has turned in some promising results. Materialise's stock has also held its own because the company went public in mid-2014, after the love affair with 3D printing stocks began cooling off. Here are the earnings dates and analysts' estimates for the six pure-play 3D printing companies. We don't have earnings estimates for Arcam. That's largely because it's a smaller, foreign-based company that trades over the counter in the United States. Like ExOne, it's strictly involved in the industrial market. Arcam releases earnings at 8 a.m. CEST (Central European Summer Time) -- or 2 a.m. EDT -- so later-night folks can check out its results well before the market opens on Wednesday. 3D Systems vs. Stratasys: Which Had the Better 2018 Earnings Results?